A little worse for the wear this morning thanks to a piece of bad fish. The turntable has slowed from 78 to 33 so finally dragging myself in front of the letters and numbers. Great job by our boys Pete Kostelnick (5th, 57:10) and Jerrod Anzalone (8th, 58:45) at State Farm Saturday. Huge pr for Pete and Jerrod’s recent leg issues seem to be resolving. Stacy Mangers Shaw took first in the 45-49 with 1:06:59. Congratulations to Lincoln Running Co Racing Team on their 9th place finish at yesterday’s USA Club 8K Road Champs in 1:40:06. Tanner Fruit-23:55, Michael Rathje-24:56, Tom Nichols-25:00, Logan Watley-26:15. Team Nebraska A was 11th in 1:41:08 like this: Luka Thor 24:36, York Thomas 25:15 Colin Morrissey 25:26, Cory Logsdon 25:51. Team Nebraska B was 20th in 1:47:18 ala Justin Mollak 25:32, Matt Heesch 27:02, Cheto Cerda 27:03, and David Bohlken 27:41. Hope to be feeling better tomorrow, be nice to each other. This entry was posted in Uncategorized on March 31, 2014 by runguru. 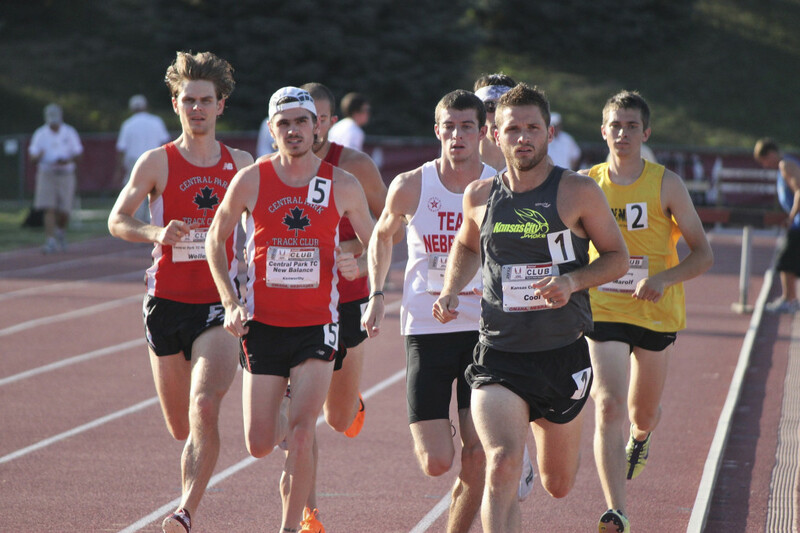 This weekend will be a bit of a twist on the local running scene with almost all the top talent taking their strides to the Shamrock Shuffle 8K Club Championships in Chicago. Yo tengo huevos mas grande. Big enough to put my predictions in front of Buddha and the world. 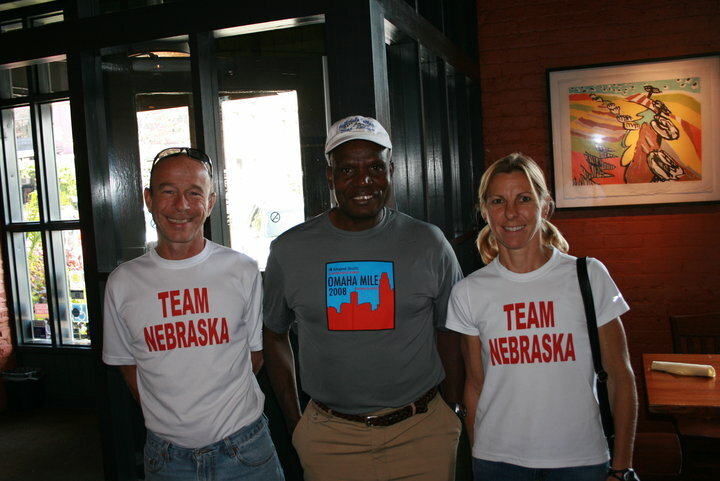 Shamrock Shuffle: I’m going with Team Nebraska A over LRC Racing. Peter Falcon, Colin Morrissey, and Cory Logsdon have all raced this spring, Luka Thor hasn’t but reports training very well. I haven’t seen Yorkie Thomas on the roads at all but his selection to the A team must mean something. LRC Racing has had good spring showings by Michael Rathje. Tanner Fruit should be a strong contributor but I haven’t seen any results for him. Tom Nichols is the elder statesman but can still occasionally pop a good one. Andrew Jacob and Logan Watley will need to bring their best A game for it to even be close. In fact the race might be between Team Nebraska B ( David Bohlken, Matt Heesch, Cheto Cerda, Justin Mollak and Nate Stack) and LRC for 2nd Nebraska team. Either way, go get some boys! I expect to see a strong showing by Ashley Miller on the women’s side, talent trumps every time. Bridget Easley is always, always tough. Megan Zavorka’s 19:31 5K from Saturday indicates either a poor race or questionable fitness. And I’m not familiar with Leslie van Winkle so won’t postulate on her. Wishing everyone great racing nonetheless. On to State Farm. Theoretically the 10 mile and 5K should be wide open on the men’s side. Eric Rasmussen? Eric Noel? Neil Wolford? With LRC Racing not sending a women’s team to Shamrock they should dominate the distaff field. Maybe another great battle between Michelle Paxton and Frankie Petersen? I’m not finding a list of registrants but the pool of talent remaining should make it a very interesting if not pedestrian morning. I guess we’ll find out who’s fit and hungry. Big shout to my buddy Steve Stender and SUBWAY for arranging chips and cookies to round out our Ni-Bthaska-Ke Trail Run post race meal. Omaha Steaks, Rotella’s, US Foods Inc., and Upstream Brewing Co all pitching in to make sure you are well fed and watered post race. All included with entry fee. Can’t get that with satellite, what? This entry was posted in Uncategorized on March 28, 2014 by runguru. Waterloo has one of the nicest libraries I’ve seen in Nebraska. Nearly brand new, Agnes Robinson donated a small fortune for future generations, bless her. I went in for my card a couple of days ago, picked up some Great Books. Love Song to the Plains, Mari Sandoz, 1961. Acceptance of the Statues of J. Sterling Morton and William Jennings Bryan.. presented by the State of Nebraska, 1937. 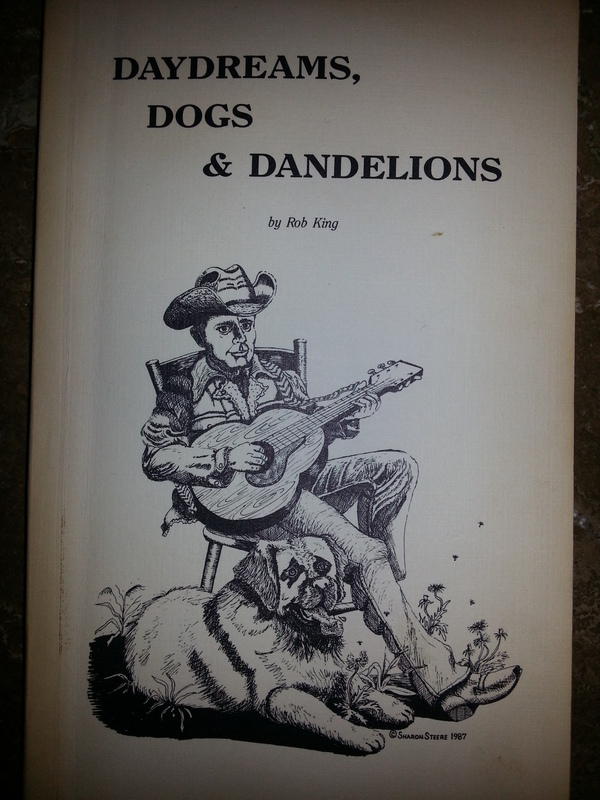 Daydreams, Dogs, & Dandelions, Rob King, 1987. But he could hold his own with any man. Givin’ to and takin’ from the land. Billy had a shack down along the track. He and his old dog, they called it home. When most folks wouldn’t speak, when they passed him on the street. Well, there never was a man Billy owed. He never owned a car; never went that far. His world was small in 1935. When he heard a lonesome whistle moan. Smokin’ on its way back home. He saw little Jimmy Dickens, only three. His eyes looked up to Billy with a plea. Runnin’ like he’d never run before. Then he shook hands with engine Forty-Four. And they found Billy fifty yards away. Not one word did they hear Billy say. Everybody cried when little Billy died. This entry was posted in Uncategorized on March 27, 2014 by runguru. Wednesday Night Track Work kicks off tonight and I couldn’t be more excited. This is our 7th year of providing an opportunity for athletes of all abilities to come out and experience camaraderie as well as the exhilaration of personal potential realized. My chance to touch the larger running community. Integrating and instructing the various talent levels into a single hard working, fun loving group that inspires and motivates each other to greater good. No headphones allowed. I’d prefer you not chew gum. Be courteous with those sharing the track. Be respectful of each others efforts. Donations kindly accepted. That’s about it. Those that gather under my mantle improve. Period. Regardless of where they start. And we all learn to be comfortable in our own talent. Appreciate that some individuals are more naturally gifted (better, horrors! ), that some teams are more talented (better, gasp! ), but we can all still fill the bill of pursuing personal potential realized. They aren’t threatened by or take offense to my challenges. I empower athletes to think like a champion. To not be weak, or wrong, or lazy, or crazy, or comforted into milquetoast or misguided by fools. blah, blah, blah…. 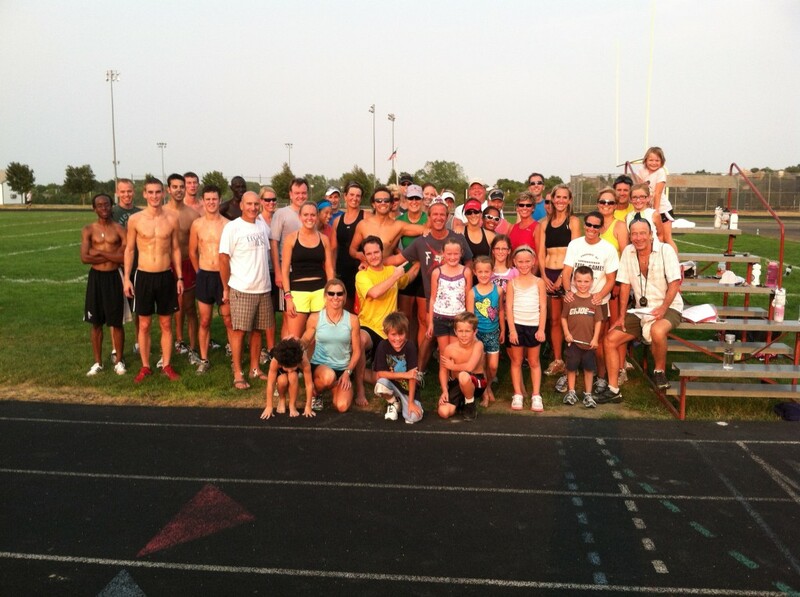 The last 6 years I’ve coached runners from TNB, ORC, GOATZ, NDORFNZ, LTC, LTF, WECRAWL, etc. as well as staunch individuals. They have all gotten my message loud and clear. Hundreds have been welcomed and hundreds have come away better, more complete runners. All have been supported, and appreciated as they pursue their goals. Every step of the way. Coach Tully, Coach Linda, and I look forward to helping you and yours achieve more and better. Let’s Get Some! This entry was posted in Uncategorized on March 26, 2014 by runguru. Pulled together opposite ends of the spectrum yesterday. Reader One: The first end grabbed me via email, I always enjoy and appreciate hearing from Mitch (we’ve never met). He has a sound knowledge of our sport, both athletically and administratively. We don’t always agree but I take what he says to heart. It was suggested that I read the above rule. I told him I wrote it, I’m not sure he believed me. This is what we, as the USATF Club Council, deal with and do. At every club championships. Cross, Track, Road. There is at least one instance of membership question every time. My reply to Mitch was that my words were meant as an educative tool. Were actually a pat on Logan’s back for doing the bare minimum of research necessary to find out what the rules are. Reader Two: Linda, Kyle Clouston and I hosted an athlete to chili and beer last night at the Bar None. It was a two way NRGE interview, she delving into my style and philosophy (got an earful) me plumbing the depths of potential and mental strength (must have both). She had stumbled across these pages and had been reading for a while before deciding to reach out, something I appreciate and applaud. How courageous and determined. 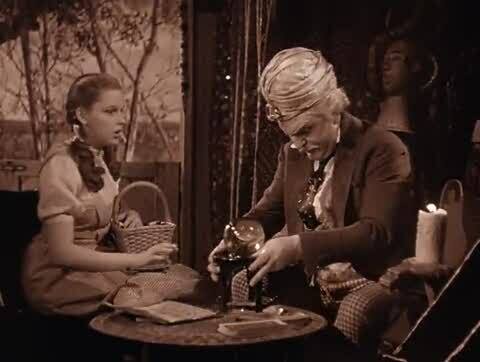 Reading my daily opines, knowing my reputation, and still willing to brave the heat of my personal brand of Tempered Excellence. Somewhere along the evening these words sprang forth true and unbidden “NRGE is not a Socially Competitive club, we are a Competitive Social club”. A subtle nuance really, we are all runners after all. Competitive before Social. Social after Competitive. I’ll paraphrase Dr. George Sheehan, There are 3 kinds of runners. 1) Health. These runners are in it to lower or elevate or otherwise address or improve poor health. Usually find running drudgery. 2) Hugs and Kisses. These runners need the daily accolades afforded by a more social atmosphere. Often thrive and enjoy the sport very much, motivated and inspired by mutual stroking from others of their ilk. 3) Solo. Have placed running at the top of their priority list. Value and crave time away from the madding crowd. Honest with self, own worst critic. Only works well with others of similar constitution. My old buddy Gary Dougherty understands this better than most. This entry was posted in Uncategorized on March 25, 2014 by runguru. Interesting weekend on the local roads and you know I’ve got my own spin. Are you kidding me? 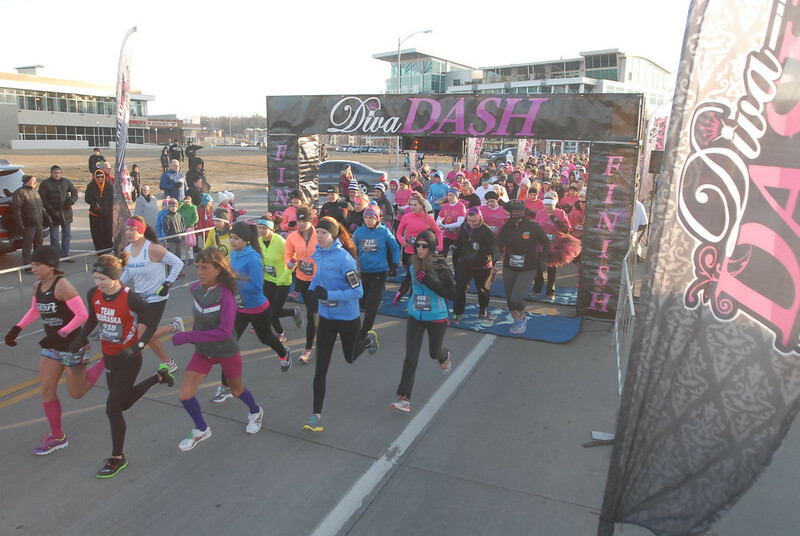 How did I miss that there was a decent prize purse available at the Diva Dash 5K? Top five finishers in the 5K ($400, $300, $200, $100, $50) and the top Masters finisher ($200). Christy showed that she might be getting quite long in the competitive tooth but can still hand it to the youngsters. Surprised the heck out of me. Zavorka tuned up for this coming weekend’s 8K Club Champs. Over $1000 in prize money and No LRC gals, 1 Team Nebraska, and a couple of NRGE masters. Credit to Kear and Vincent, some youth to look out for later this year perhaps? Michel Davy at 35, a lot of untapped potential. Morgan Chaffin, tri studette. Very interesting indeed. 1. Christy Nielsen 38 18:52****Red Dirt Running Co.
For those that preferred something a little longer there was the No Frills 10 Mile to wrap up Craig Christian’s 2014 series. NRGE’s Mike Wasson (48) did not relinquish his stranglehold on the top spot, earning some frilly frills in the process. That ageless studette Anne Medeiros (70) took the series title for the women. Great work on providing opportunities to get/keep sharp Craig! Who will bring bragging rights back to Nebraska? LRC Racing? Team Nebraska A? Team Nebraska B? Tom Nichols is representing LRC Racing. Interesting as our old buddy has lived in Colorado for at least a couple of years now. Either Logan Watley has cracked the code or there will be some questions raised. Its a hot seat here on the USA Track & Field Elite Development Club Council. Seems like somebody else’s business is always mine in this arena of post collegiate competition, tough job but somebody has to do it. Me! Me! Fond farewell to one of my favorites. Kathy Nary headed up the Women’s LDR International Competitions Committee for very many years. It was Kathy that would call me (and Linda) with offers of “USA Team Leader” or “USA Coach” for international traveling teams. 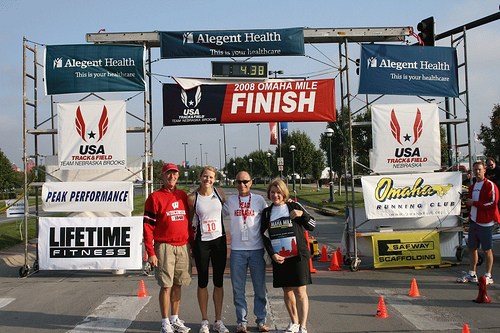 Her volunteer position has been “relinquished” to the USATF National Office. Expect more shenanigans from Indy and ire from the athletes. Kathy, we love you and appreciate all you have done for our American women athletes! This entry was posted in Uncategorized on March 24, 2014 by runguru. Call it an era. No more than a blink of the eye really. A brief snippet in time, a flash that burned brightly for all to see, illuminating the way for those that would follow (everyone else). 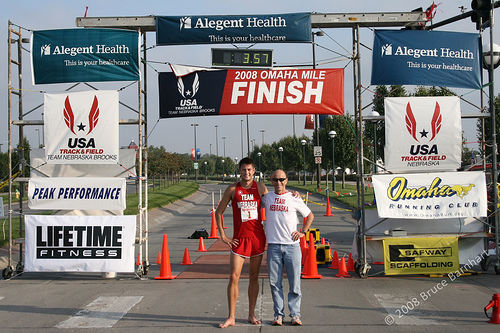 2004-2012 should and will always be remembered as The Golden Age of post collegiate competitive running and racing in Nebraska. 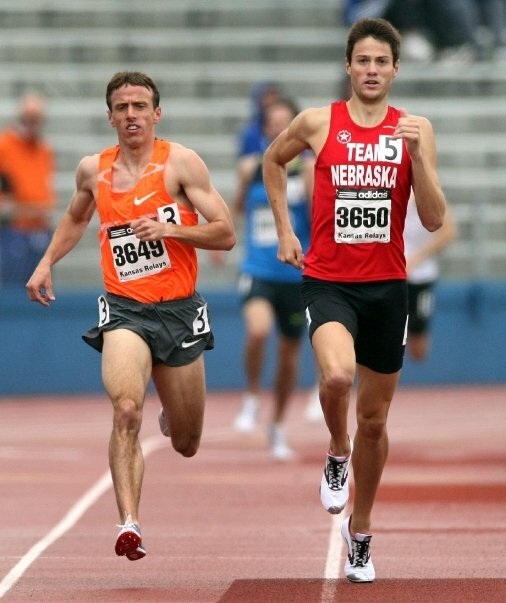 Whether it pleased you (or not) or squared with your sensibilities (or didn’t), there is no denying that those years shaped the future of distance running and track and field in Nebraska. Set the bar so very high, a beacon for future generations, a challenge to those that would seek excellence. To Be In It To Win It. 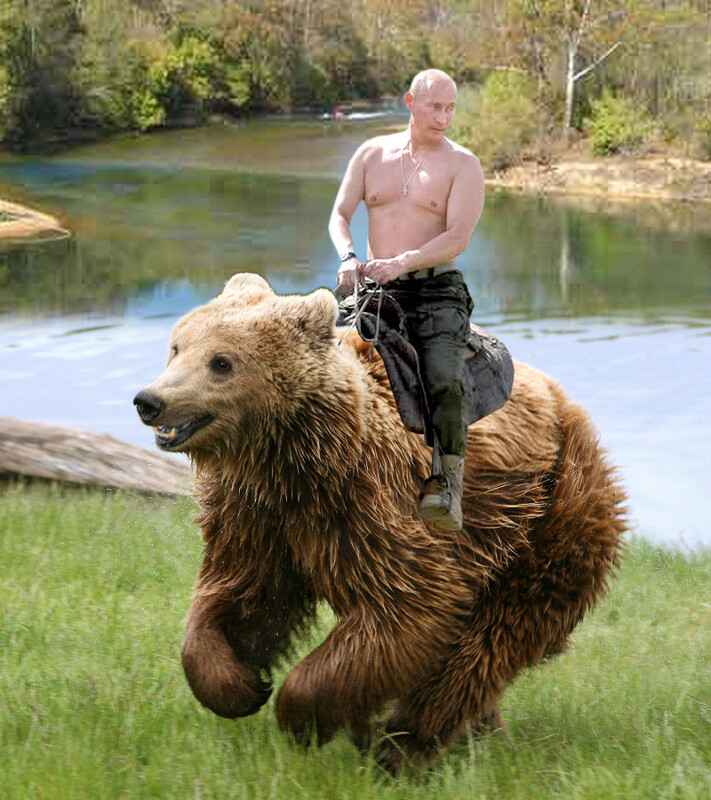 To Giddyup! Thanks especially to James McGown, Mike Morgan, Angee Henry, Peter van der Westhuizen, Aubrey Baxter, and David Adams. You made memories for a lifetime for us all. Remember when 18 year old high school phenom Alan Webb ran 3:53.43 back in 2001? Breaking Jim Ryun’s 3:55.30 prep record that had stood for 36 years. 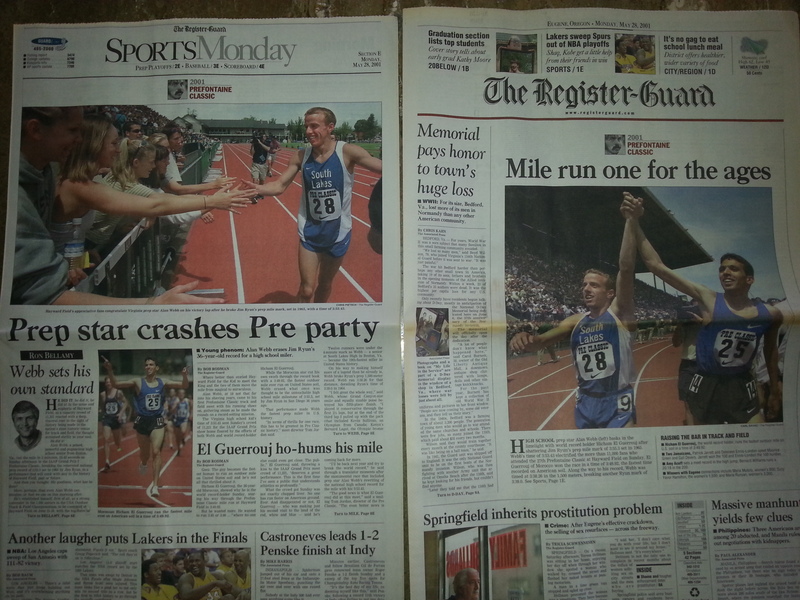 I had to get a copy of that day’s Register Guard. Don’t ever forget! This is what I was talking about then and even today. Like I would ever let you! These kids had talent, I brought the intangibles. We did everything we could to introduce Real Racing to Omaha. 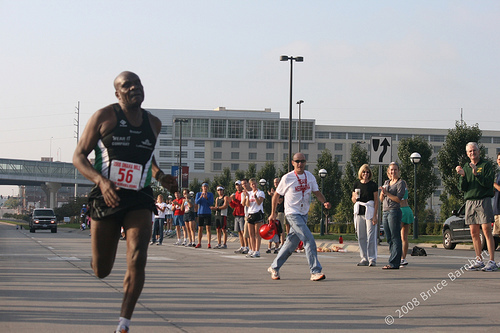 Multiple World Record holder Henry Rono in town for the Omaha Mile back in 2008. 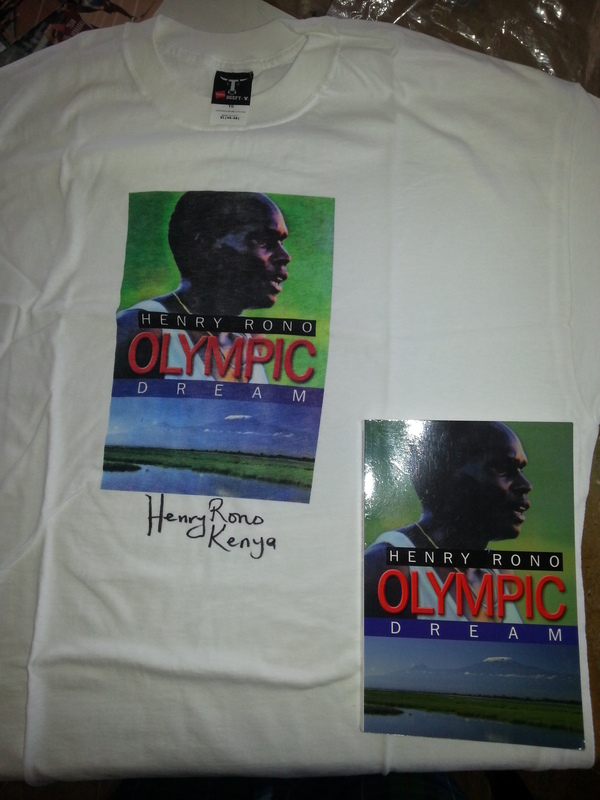 Autographed t-shirt and book a nice addition to my collection. Fond reminisce of another time and attitude. 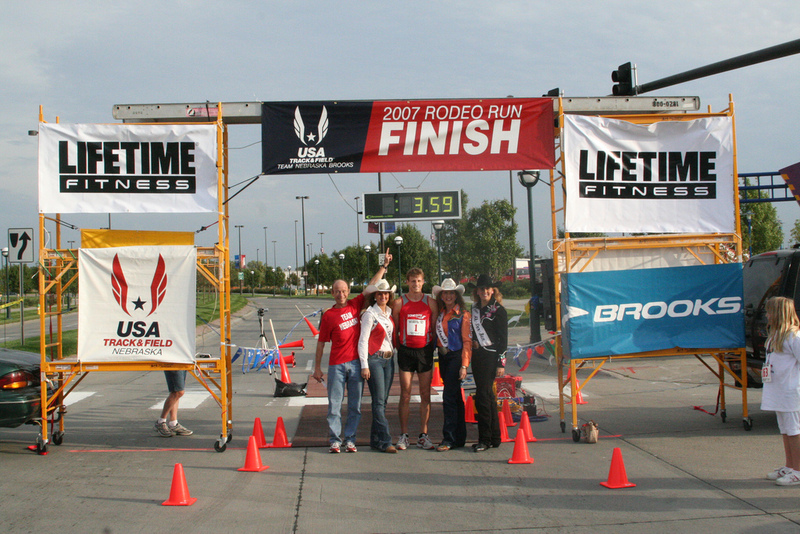 2007- Nebraska’s first ever USATF Certified road mile under 4:00. Ryan Kleminhagen. I didn’t make Peter van der Westhuizen fast, but I helped him to run faster on his way to the state record for 1 Mile road races the very next year. And a Nebraska state record on the women’s side thanks to Alice Schmidt. 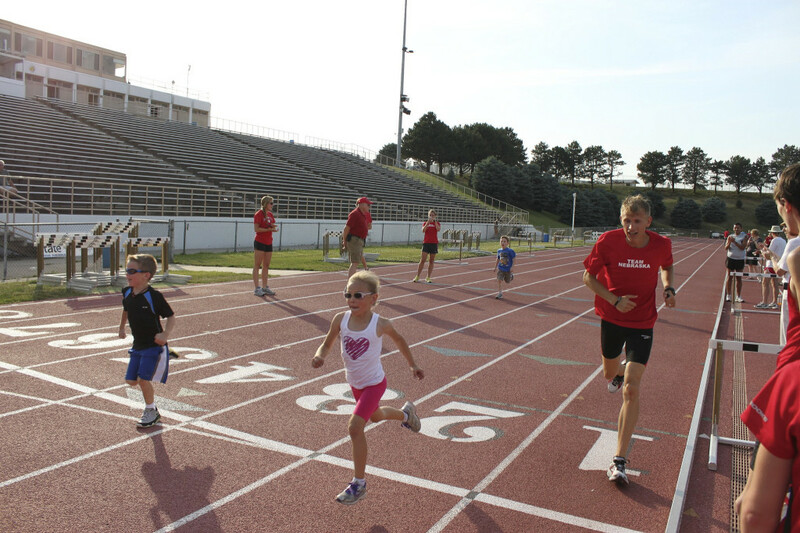 David Adams wrote his own chapter in Nebraska running lore and inspired a few fast kids in the process. Efforts culminating with the 2012 USA Track & Field Club National Championships at Burke Stadium. By my hand, in my hand. This entry was posted in Uncategorized on March 21, 2014 by runguru. Ventured into “the city” last night for my weekly session at the Upstream Brewing Company. Two and through the motto shared by both Linda and me. Moderation baby. Was happy to run into Coach Tully, we’ll be bringing our Wednesday Night Track Work back to the stage beginning next week. And his buddy Denny Gray, possibly the very first person I met after moving to Omaha 13 years ago. I wasn’t at all offended when Denny insisted that I am “odd”. I understood exactly where he was headed. He likes the fact that I do whatever strikes my fancy. I’m odd in the sense that I have no intentions or enticements to fit anyone else’s presumed assumptions of accepted behaviour. Odd in that I stand in front of everyone with my declarations of individualism, thumbing my nose at everyone that would have otherwise. Wearing my heart on my sleeve and proudly. Often toe to toe. I wasn’t meant for meekness. Denny looks at Linda and me with an appreciation and respect reserved for not very many I would guess. The fact that we took control of our lives and made them into something wonderful, against all “odds”. The fact that we determined our own happiness and cared less about the finger waggers and whisper slingers. Our courage against what at times seemed to be the entire running community, for sure the Far West Omaha/LTF/RD component at any rate. Tell me again exactly what I’m missing by lacking their favour? Which led to a discussion of “Running Wives” and “Work Husbands”. Those people that are paired up outside of marriage, often delightfully if not by design, that seem to be standard bearers for happiness and how to get along. My friend/client from Tuesday is a professional wedding planner. She asked me to catch her up on what I’d been up to the last two years. When I told her my tale she was not surprised at all. Reminded me that even a few years ago she had decided Linda was my “Running Wife.” And she wasn’t alone, most people we encountered figured us a couple. As I’ve said before, I was the last to know and believe it or I don’t care, Linda was likely the next to last. I brought up several other local “prominent” couples that seem to fit this model. Wives that spend an inordinate amount of time away from husbands and children. Husbands that do the same. All running away from something. Doing anything and everything apart. And then running right back only to plan the next getaway. Many of whom wag their heads over Linda and me. Hypocrites. This then is our proof. Linda and I love to do everything together. Eat. Sleep. Play. Work. We are totally in synch. And I guess we always were. This entry was posted in Uncategorized on March 20, 2014 by runguru. The sky really does fall sometimes, more like things fall out of them. I’ve spent quite a bit of time lately gazing into the great blue sea of a sky, rapt by the now million and more birds carrying out their annual and genetic adventure. The thousands that fly as one, way way up there, nothing falls from them. Its those that whiz by seemingly just overhead that are likely to let loose an alabaster load, better be wearing your shades and a hat. Tragic story about the helicopter in Seattle. Plummeting and crashing onto a city street. Another story from Seattle; My buddy’s brother was sitting in his car on an exposed level of a parking garage. Fifteen stories above a car crashed through a railing, dropped, and pancaked both vehicles. Sad but true. I was in my former hood yesterday. The trail behind my house, well worn with 12 years of use, now barely discernible. It wound ~ 1/8th of a mile and then under 180th St., that little bridge that you cross just South of W. Center. A favorite place because it is the lowest point around and there is often a noticeable and pleasant temperature gradient. The bridge collapsed and 180th is closed in both directions. Heads up! My heart breaks for the families of those aboard Malaysia Airlines Flight 370. If you were wondering why there was no coverage of the Blarney Stone 5K on Monday night it is because there was a noticeable lack of competition. Where have all the speedy folk gone? 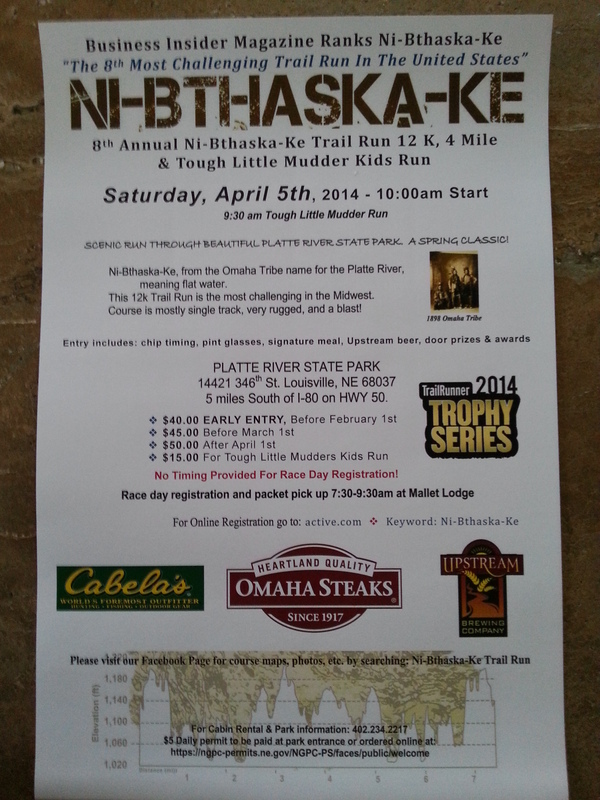 A few will be in Plattsmouth this Saturday for the final No Frills, this time 10 miles. A good chance to be honest with where fitness lay. Want to race me? We are closing the additional swag option over at active.com’s registration for the Ni-Bthaska-Ke Trail Runs at midnight tonight. If you’ve been waiting be sure and get it going today. I will however be ordering extra hoodies and t’s to commemorate the incredible morning. This entry was posted in Uncategorized on March 19, 2014 by runguru. Only time for a quickie this morning as I’m reconnecting with an old client shortly. It will be my first run at the old dojo in a long time. Sometimes a column title pops in my head and the body is crafted around it. Today is an example. I’m Russian to get this written, so maybe not as fully fleshed as I would want, ha! It is standard operating procedure for international invited elite athletes to bring the race director and/or elite athlete coordinator a gift of appreciation. 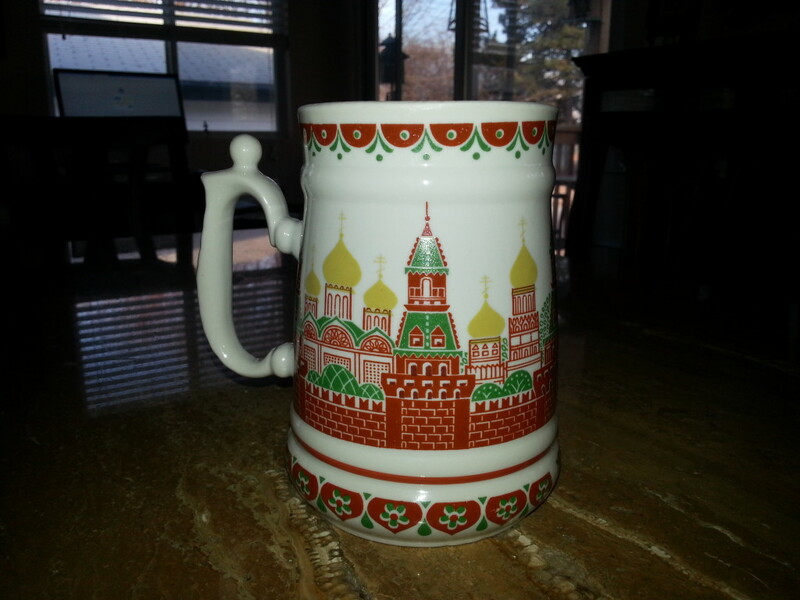 This fine stein was presented to me by Yuri Mikhalov at the Run For The Arts. 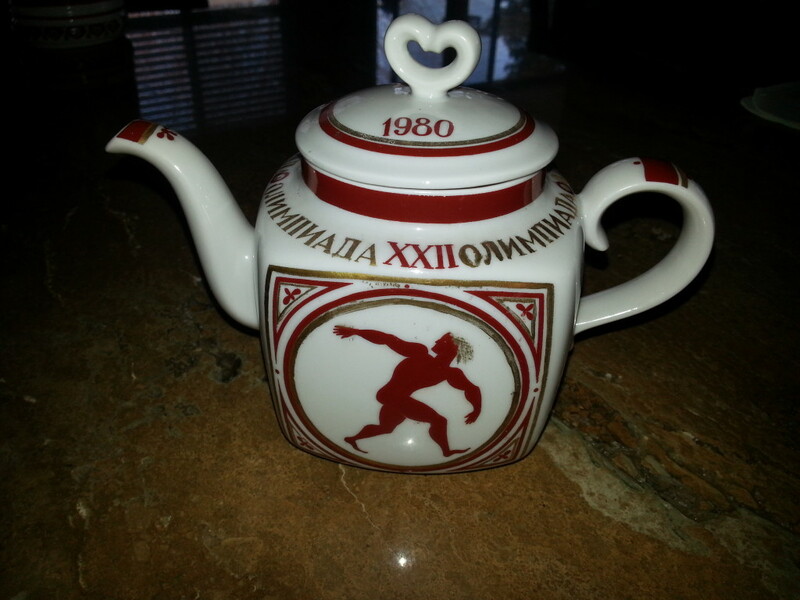 Leonid Shvetsov gave me this 1980 Olympic decanter when I brought him in for the Bayou City Classic one year. Worst gift ever? A case of Russian Potato Beer. 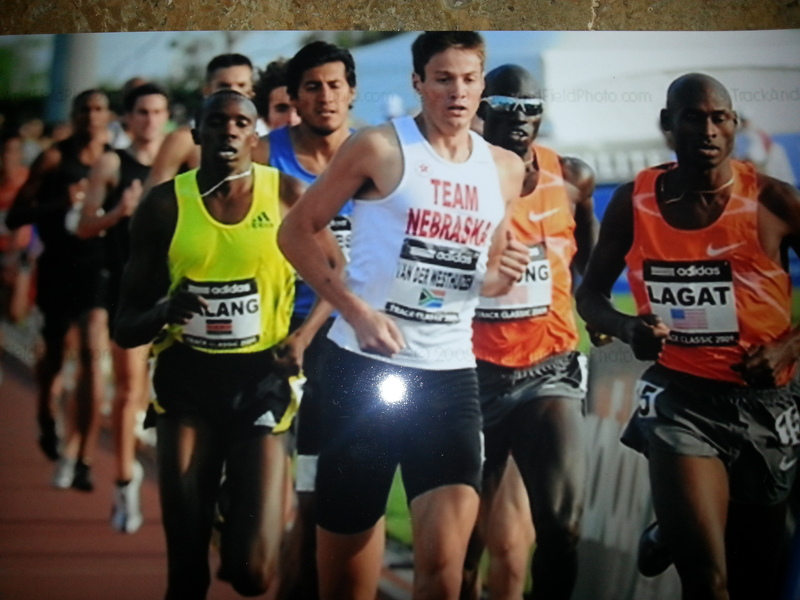 This entry was posted in Uncategorized on March 18, 2014 by runguru.